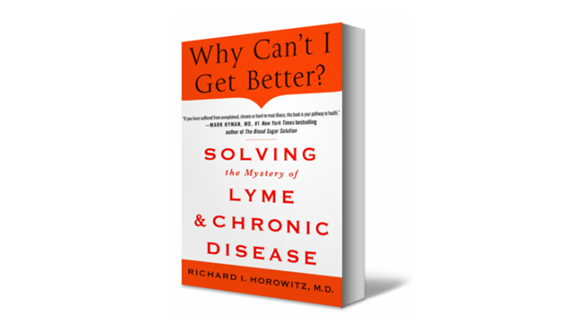 Interview: Dr. Richard Horowitz, MD, Author Of "Why Can't I Get Better: Solving The Mystery Of Lyme & Chronic Disease"
Laura Wild: Congratulations and thank you for writing "Why Can’t I Get Better? : Solving the Mystery of Lyme & Chronic Disease" (on sale now from St. Martin’s Press.) To me and the Lyme disease & MSIDS community, this book represents newfound hope on the horizon for everyone who has been suffering from complex infectious disease syndromes for so many decades. Finally, I believe that your MSIDS model represents a new paradigm in medicine, one of tremendous fortitude and clarity. I have no doubt that your new book will save a tremendous number of lives and represents a solid plan to address the global Lyme and tick borne illness epidemic. "Why Can't I Get Better?" breaks ground with a new 16 point differential diagnostic map as the basis for his revolutionary MSIDS model to treating all chronic illness. Dr. Horowitz's enlightening story of medical discovery, science and politics is an all-in-one source for patients of chronic illness to identify their own symptoms and work with their doctors for the best possible treatment outcome. Laura Wild: Dr. Horowitz, what do you believe is the true number of people in the world with tick borne infection at the root cause of their illness? You mention in your book on page 2 "Lyme and other tick-borne disorders have been identified across the globe and are causing untold suffering and disability in millions of people every day. It is no wonder that Lyme and associated tick-borne diseases (TBDs) are called "the great imitators." Because the testing for Lyme disease is plagued with inaccuracy, based on your clinical experience, what do you believe is your best estimate of a global percentage of people infected with Lyme? What do you think is the estimated world-wide percentage of people co-infected? Dr. Horowitz: When I consulted with the Chinese government several years ago, they told me that up to 6 % of their 1.3 billion people had been exposed to Lyme, and that was using insensitive blood testing like the ELISA test, which can miss approximately half of the cases. It is therefore possible that up to 150-200 million people have been affected by this epidemic since Lyme has spread worldwide, and has been known to be around since the 1800's (it has actually been around a lot longer, since the DNA of borrelia was found in Otzi, the Neanderthal man, 5000 years ago). Dr. Horowitz: We must look at the common denominators. When you go through the scientific literature which is outlined in my book, the one common denominator for chronic fatigue and fibromyalgia is inflammation. The MSIDS model is still applicable if you do not have Lyme because it is still the same inflammatory problem at the core. The inflammation can be due to inflammatory molecules called cytokines, such as TNF alpha, IL-1 and IL-6, and it doesn't matter whether the inflammatory pathway was stimulated by bacteria, a virus, and an environmental toxin or by an emotional trauma, it still sets off the same inflammatory pathway. It doesn't mean that every one of these cases of fibromyalgia or chronic fatigue is Lyme. It could be what I call non-Lyme MSIDS. These patients may have the same symptoms whether they have borrelia or not. They may have fatigue, trouble sleeping, joint and muscle pain, environmental toxins, food sensitivities and allergies, hormonal imbalances and so on. With MS, 95% of the patients that come to me who have failed MS drug therapy have tested positive for Lyme. With regards to MS, we know it is a demyelinating disease, so when you apply the MSIDS model to this illness, and look for the multi-factorial causes for MS, we might find Lyme, Bartonella, vitamin D deficiency, mercury toxicity, and chlamydia pneumonia. Dr. Horowitz: If someone has never been treated with antibiotics, I would say that it is safer to give them a short course assuming they are not too sick, but this has to be on a clinical case by case basis. If someone comes in and they have tried antibiotics before, having previously targeted all the forms of Lyme and the associated co-infections, and they are not feeling too badly, it would be reasonable to put that person directly on an herbal protocol. However, if that person has not been properly rotated through the different antibiotic protocols, then it makes more sense to me to try to lower the bacterial load with antibiotics. This would be done with combinations of antibiotics to target all the different forms of the borrelia infection (cell wall, intracellular, cystic forms, also targeting biofilms). Even though herbs can be effective, I still find that antibiotics are essential in the vast majority of my patients, just as anti-parasitic medications and herbs are essential when patients are co-infected with Babesia. The key is to apply the MSIDS 16 point model, so you don't have to use as much antibiotics if you can find and decrease the other sources of inflammation. This is especially true when you are detoxing the patient properly, since lowering the load of toxins is often essential to get the majority of patients to feel better. The key is to rotate treatment protocols if patients plateau, and treat all the co-infections, but once you have lowered the bacterial, parasitic and viral load of these infections and patients start to feel reasonably well, I don't think you need to use long term anti-infectives until they report that they are 2 months symptom free. One other important option that I use, especially in patients whose GI tracts do not tolerate the antibiotics well, is to just do one antibiotic with herbs. This helps to keep down the side effects of the antibiotics. Another option is to mix different herbal protocols together without antibiotics. There's no reason why you can't use the Nutramedix/Cowden protocol with the Buhner herbs or Byron White herbs or the Chinese herbs. Let's say for example a patient has Bartonella, you can use the HH from Dr. Zhang's protocol with A-Bart from Byron White and Houttuynia from the Cowden protocol. You can mix and match these herbal protocols, just as you would antibiotics. I find that all of the different herbal protocols are all about 70% effective. Most patients with a history of persistent Lyme symptoms need to stay on an effective herbal protocol for months to years after traditional treatment protocols or they will relapse once they are taken off. Laura Wild: Dr. Horowitz, do you believe that there are environmental factors negatively impacting our immune systems that make certain people more vulnerable to tick borne infections? (GMO's, heavy metals, food allergies etc.) Do you believe that a stressful event (i.e. death, marriage, childbirth, surgery etc.) can trigger dormant Lyme? Dr. Horowitz: Environmental toxins are one of the points on the MSIDS map contributing to persistent illness. Most of the environmental toxins people are getting are fat soluble so they get into your brain. This is the case, for example, with mold neurotoxins now showing up in a certain percentage of my patients. The problem we therefore face as clinicians is when you have cognitive difficulties, we don't know if it is due to the Lyme, a co-infection like Babesia or Bartonella, or a neurotoxin like BB1 or quinolinic acid being produced during the infectious process contributing to the central nervous system symptoms. Or perhaps it might be some combination of all of them, with associated environmental toxins, like mold neurotoxins or mercury exposure also increasing neurocognitive symptoms. Similarly, if you are zinc deficient, which is the case in up to 25% of my patients, you can get a biochemical bottleneck where you can't convert alcohols to aldehydes in your liver. This causes patients to feel foggy and spaced out. In medical school we learned about these aldehydes when we learned about a sleep drug called chloral hydrate. The popular name for that drug was a Mickey Finn, and they used it in medicine years ago as a sleep aid. So you could be getting brain fog from multiple sources like environmental toxins, and from aldehydes, especially if your phase 1 liver pathways aren't working properly. It's therefore not just a question of using drugs like Rocephin that penetrate the central nervous system in Lyme disease if your memory and concentration doesn't work and you have failed oral antibiotic regimens. You need to go back to the MSIDS model described in my book to determine all of the possible overlapping factors contributing to inflammation that causes that particular symptom. For example, memory and concentration problems could be due to occult B12 deficiency or thyroid deficiency. It could be due to a co-infection like Bartonella that needs a different antibiotic/herbal protocol. It might also be due to a high load of environmental toxins that are all fat soluble, with an inability of our body's detoxification systems to clear them out. I have found that glutathione clears up the brain fog in 70% of my patients. Another problem with mercury is that it suppresses the immune system and can overlap every Lyme symptom you see in patients. Even food sensitivities may play a big role in people’s fatigue, joint and muscle pain and brain fog. If you eat a food that you are sensitive to, it can trigger a fibromyalgia flare similar to a Herxheimer reaction, and you will experience the same inflammatory reaction that stimulates all your Lyme symptoms. If you then add a stressful event on top of that, patients often will experience a significant relapse of symptoms. Stress plays a big role because it suppresses our immune function, and I have seen low adrenal function from a stressful event trigger a Lyme relapse or flare of symptoms in patients who were previously doing well. We therefore need to detoxify the internal and external biotoxins getting into us, and keep a strong healthy immune system, while working on stress reduction, such as doing regular yoga and meditation. These steps often help to keep patients feeling better. Laura Wild: Dr. Horowitz, what do you believe needs to happen to stop tick-borne illness in its tracks? In your book you discuss the importance of getting to the root cause of each patient's symptoms. If you draw the same parallel with the getting to the root cause in the environment, what would you like to see done? How can we stop tick borne disease from spreading? Dr. Horowitz: The first thing we need to do is educate people about tick-borne diseases and how far they have spread. We have to teach everyone about the symptoms, especially high-risk groups like the Boy Scouts and Girl Scouts, outdoor lovers, hikers, campers and children going on field trips, so that we spread awareness of how easy it is to get this disease and what symptoms to look for with Lyme and associated tick-borne illnesses. However, someone living in a Lyme endemic area can also get a tick bite and get sick just walking across their lawn, so everyone needs to learn to do regular tick checks, practice preventative measures, such as wearing light colored clothing and using insect repellants on their clothes like permethrin, and learning when it is appropriate to treat a tick bite. I will usually treat someone who has a tick on them for several hours, especially when it is embedded and difficult to remove, and where the person may have accidently squeezed the tick in the process of removing it. It is also important for animal lovers to do regular tick checks on their pets, since that is an easy way to bring them indoors. Treating lawns and gardens at home may also be helpful, using products like Ultra Tempo, Damminix, and using bait boxes for mice. For highly endemic areas like in New York, I believe that the state needs to study swatches of habitat and apply different measures to lower the tick population in those areas, studying the efficacy of different approaches. That could vary between using deer feeders, to spraying lawns with chemicals that kill ticks, or even doing a trial of using a natural pesticide from a fungus called metarhizium anisopliae strain F 52. It's a strain of fungus that's been shown to reduce the tick population by 74% and is non-toxic. This type of fungus has not been used yet in clinical studies, it but it is something that needs to be studied to lower the tick population and help reduce the burden of disease. Another method that is easy to apply to help prevent long-term complications from Lyme disease would be to use the questionnaire in my book as an early screening tool. This would apply to a broad range of physicians and health care providers’, including psychiatrists, OB-GYNs, family practice doctors, podiatrists, internal medicine doctors, infectious disease specialists, rheumatologists, neurologists and all of the sub-specialties because it is a multi-systemic illness and can mimic common diseases seen in all of these providers medical practices. If a doctor was seeing a patient and only had 15 minutes in a typical HMO visit, they could give their patient this questionnaire before they came in for their visit. If the patient circled 25 out of 38 questions, then you know you they have a multi-systemic illness. This can help focus the medical provider to look for Lyme disease and send off tick borne testing, for if you catch these infections early they are much easier to treat. For this model to be effective however, we need more reliable blood testing, as well as educating doctors to expand the testing to include other common tick-borne diseases that can mimic symptoms of other diseases seen in their subspecialty. Laura Wild: Do you feel that babesiosis can be chronic and relapsing? Do you feel that babesia treatment should be as open-ended as Lyme disease treatment is? Can you educate us on the global impact of babesia? Babesia is the number one co-infection that keeps people sick, with Bartonella and mycoplasma right behind. I did studies back in 1999 on Babesia that I presented at the 13th International Lyme conference, where I gave patients either Mepron and Zithromax or clindamycin and quinine for Babesia, and crossed them over to the other drug regimen if they clinically did not respond. I found that I could still get proof of persistence of Babesia by PCR (DNA), or RNA (FISH test), up to 5-9 months after they finished treatment with either drug regimen. It is very difficult to treat chronic relapsing babesia. Now if you get it early, just like with Lyme, and it is not associated with co-infections, you might be able to cure babesia. But one of the problems we now face with Mepron, our primary drug to treat Babesia, is resistance to it, so I have to rotate patients though multiple Babesia regimens, and often have to use antimalarial herbs at the same time to increase the efficacy of the drug regimens. Even with this approach, I still find that Babesia can persist, although patients tell me that they feel better as I lower down the load of the parasites in their body by using different drugs and herbs in combination. The diagnostic problem we face with Babesia is that there are over 100 strains of these blood-borne parasites, called piroplasms, and although we can test for Babesia microti and Babesia WA-1 in the US, (the CDC doesn't even recognize WA-1 at this point in the northeast), we can't test for all of other strains. In Europe there is also another species, called Babesia divergens, which can cause hemolytic anemia. Although Babesia microti has been known to cause hemolytic anemia, we don't generally see it in our patient populations, but instead we tend to see subclinical presentations, which fool many doctors. Babesia is a worldwide problem and it has spread just like Lyme, and I don't believe we are adequately tracking the spread of this infection. Why is it important to track Babesia? Babesia can be fatal in the very young and elderly with suppressed immune systems, and if a patient takes steroids and has Babesia, it can be potentially fatal. Babesia is also now in our blood supply, so we need to be paying close attention to this tick-borne co-infection, which is spreading and contributing to chronic symptoms I see in many of my patients. Laura Wild: In chapter 14, you discuss Lyme and Autonomic Nervous System Dysfunction/POTS. You discuss various measures to help control symptoms (i.e. florinef, beta blockers, SSRI's). Dr. Horowitz, in your experience, will all of those problems (i.e. vagus nerve inflammation) resolve with antibiotics, or can there be residual damage of a post-infectious nature to the patient's nervous system? Dr. Horowitz: Out of all the 16 points on the MSIDS map, POTS/dysautonomia is one of the ones commonly overlooked by physicians. When the Mayo clinic did some of the initial studies on dysautonomia (an imbalance of our autonomic nervous system that controls our blood pressure, heart rate, GI tract and bladder), they did not report an association between Lyme and POTS (Postural Orthostatic Tachycardia Syndrome). This is undoubtedly because they were using CDC criteria to diagnose Lyme, which misses a large percentage of people with the disease. I think POTS has been missed by physicians as a common cause of ongoing symptomatology in patients with Lyme who were treated with antibiotics and still complained of ongoing symptoms of fatigue, dizziness, palpitations, anxiety and brain fog, which are also classic symptoms for POTS. I read the Mayo clinic studies and in my opinion, the people in those studies had classic Lyme symptoms. If you check an anti-ganglioside antibody which is a marker for autoimmunity against the nerves, which was seen in the Mayo clinic studies, and is seen in POTS and Lyme, you might find that a certain percentage of both the Lyme and chronic fatigue patient populations both test positive for this marker. Lyme can cause auto-immune reactions and Lyme causes vagus nerve dysfunction. The vagus nerve is one of the primary nerves affected in POTS. The good news is that POTS does seem to resolve as patients progress through treatment and reduce their load of all these tick-borne infections. For example, I can lower down the drugs used to treat POTS such as Flornief, Midodrine, Catapress, and beta blockers as the patient gets better. There can however be residual symptoms in patients who are properly treated for tick-borne infections, and some of those patients need to keep treating the POTS by increasing salt and fluids in their diet and remaining on medications like Florinef. Fortunately, treatment with these medications is generally well-tolerated, and helps to improve the quality of life of those affected by Lyme and dysautonomia. Laura Wild: What do you believe can be done to get more medical professionals to focus on the clinical diagnosis of Lyme and co-infections? Should co-infections always be a clinical diagnosis? There is such an alarming amount of misguided reliance on lab data. How do you propose we shift this focus back to the basics of clinical diagnosis? Dr. Horowitz: Using the MSIDS questionnaire that is in my book is the easiest and simplest way of getting medical professionals to identify Lyme when they have a limited time frame to be with the patient. The questionnaire tells you if the patient is suffering from a multisystemic illness. We are presently applying for grants to get the questionnaire validated across different patient groups because the blood tests are unreliable, and we want to make sure that this is a good screening tool. With regards to co-infections like Babesia, if a patient comes in with day sweats, night sweats, chills, air hunger and a cough, we have to do a differential diagnosis first and foremost. You have to go through the list of diseases that can cause these symptoms, such as hyperthyroidism, Brucella, malaria, early menopause, tuberculosis, or non-Hodgkin's lymphoma. If you have done a differential diagnosis and eliminated the most common causes of these symptoms, and the local babesia test is negative but you have a multi-systemic illness, then the next step is to do a full babesia panel through IgeneX. I have had cases where the patient will initially test negative for babesia, but I clinically suspect it and treat them and they feel better, with the test turning positive at a later date. Co-infections do need to be a clinical diagnosis, but that's assuming you have done a proper differential diagnosis and eliminated all of the other potential etiologies that could be responsible for the problem. Neuropathy, for example, could be due to Lyme, Bartonella, mercury, lead or arsenic toxicity, or it could be due to a combination of these with a different environmental toxin like trichloroethylene. These environmental toxins combined with co-infections like Bartonella or Babesia can make the neuropathy worse. Then you might have the problem of the patient also having an underlying auto-immune disorder. But even with auto-immunity, we have to question whether Lyme might be one of the root causes, or whether a mycoplasma species might be causing an overstimulated immune system, causing the production of positive antinuclear antibodies and rheumatoid factors. So you have to dig deep and eliminate all the causes of a particular symptom, and unfortunately the testing for these infections is unreliable with an often misguided reliance on lab data. It is important to learn the clinical manifestation of all of these different co-infections, and how to do a differential diagnosis with overlapping illnesses. This is described in great detail in my book. Laura Wild: What do you feel needs to be done to improve the accuracy of testing for tick-borne illnesses? Dr. Horowitz: We need to examine the ticks and find out which organisms and strains of these infections (bacteria, viruses and parasites) are in the ticks in each state, and then create more region-specific Western Blots. This may help improve the sensitivity of these tests. Then in making the diagnosis, we can't rely on CDC criteria, which is intended for health departments to epidemiologically screen large populations; We need to teach doctors how to make a clinical diagnosis of Lyme disease after ruling out other diseases, supporting that diagnosis by finding borrelia-specific bands on the Western Blot, which show evidence of exposure. This would include finding the 23(OspC), 31(OspA), 34(OspB), 39, and 83-93 kDa bands on the Western Blot. If the patient has classic Lyme symptoms such as migrating joint and muscle pain, with good days and bad days, and symptoms that come and go, made better or worse with antibiotics, you need to use your clinical judgment and recognize that those are classic Lyme symptoms. Another way to improve the accuracy of the testing is to use certain specialty laboratories if the local tests return negative. The reason I use IgeneX laboratories is because they test for multiple strains of Lyme, their Western Blots often show Lyme specific bands not seen on other laboratory tests, and their testing has been validated by the NY State Department of Health, with frequent proficiency tests. If we were to include more strains of borrelia in the testing like IgeneX laboratories, and get better PCR testing, we would find ourselves better able to confirm our clinical diagnosis for these tick-borne disorders. We also have a problem now with emerging tick-borne infections like the relapsing fever bacteria, Borrelia miyamotoi. We don't have a commercially available test for this organism that can cause a Lyme-like illness. With this strain of borrelia, a patient can get an EM rash with a meningoencephalitis (swelling and inflammation of the brain and meninges surrounding the brain). Women can have also have miscarriages, or die from a hemorrhage with disseminated intravascular coagulation, and your Lyme test will be negative because it is not Borrelia burgdorferi, it’s Borrelia miyamotoi. You can see how important it is for us to develop better tests for these emerging tick-borne infections. We need to put more money into better research. There are several crucial points to the model which are important to understand. I treat all the different forms of borrelia (cell wall, cystic, intracellular, and biofilms) at once since these bacteria can shift forms, but there could be an individual with a preponderance of intracellular bacteria, so if a patient does not respond to a cell wall drug regimen, they may need a double intracellular regimen. I also use Plaquenil because it alkalinizes the intracellular compartment and makes the intracellular drugs more effective. So I rotate though all the different regimens, while testing and treating for co-infections, and keep going back to my MSIDS model to ensure that all sources of inflammation are being addressed. The infections clearly play one of the largest roles in keeping people sick, however, the "sickness syndrome" of fatigue, joint pain, muscle pain, brain fog and mood disorder is primarily due to inflammatory cytokines, and can be caused by multiple overlapping factors on the MSIDS model. If you don't get patients to sleep, clear up the nutritional deficiencies, remove their sensitive/allergic foods, balance their hormones, address their dysautonomia and mitochondrial dysfunction, detoxify them from neurotoxins as well as environmental toxins, and decrease their associated inflammation, you are just not going to get these people better. So the hallmark of my success is the 16 point MSIDS model, and I highly recommend it to any patient with chronic persistent symptoms who has failed traditional therapies. Laura Wild: Dr. Horowitz, what do you believe differentiates those MSIDS patients who get better and those patients who do not? Besides the obvious notions of inadequate treatment, or lack of compliance, do you believe there are other traits that separate the patients who get better from the patients who don't? Dr. Horowitz: There are clearly a group of people with these intracellular co-infections that are very sensitive to antibiotics and herbs, and we have to go very slowly. For the 5-7% of patients in my practice who don't get better, I think there are several factors at work, and again you have to go back to the MSIDS map. Some of these people are HLA-DR 2 & HLA-DR 4 positive; they are genetically programmed to have huge Herxheimer reactions when you treat the Lyme and intracellular co-infections and they get cytokine storms where the production of inflammatory molecules doesn't easily shut off. For these patients, I find that up to 75% may respond to low dose naltrexone (LDN) combined with curcumin, resveratrol, antioxidants like alpha lipoic acid and detoxification, using products like glutathione. Many of these patients are also multiply co-infected with parasites like Babesia and have chronic viral infections, and we can't always kill the Babesia, nor do we have drugs that are always effective against the viruses. Mold toxins and biofilms also play a role in keeping these patients sick, and some of the patients have methylation defects (MTHFR) where they do not detoxify well. Those patients are definitely more challenging to treat. Laura Wild: Dr. Horowitz, do you hope to get research studies going in University settings for your MSIDS model? How would you like to see those studies proceed? The dilemma I see with studies is that with so many components to MSIDS i.e. your analogy to "16 Nails in the foot" how would you set up a study? Since it is not "one bug and one drug" being studied, do you have thoughts on how to proceed? Dr. Horowitz: Absolutely, and right now different groups are fundraising to try and take our model into outside medical centers to validate its efficacy. The MSIDS model also needs to be studied by the Centers for Disease Control and Prevention (CDC), the National Institutes of Health (NIH), and by private universities. I believe we will succeed because we are in the middle of a health care crisis, where 70% of the deaths and 75% of our health care costs revolve around chronic diseases, yet we don't yet have a chronic disease model to address both the rising costs and burden of disease affecting our population in the 21st century. We have epidemics of not only Lyme disease and other tick-borne disorders, but also Alzheimer's, Autism, and cancer. We are being forced to look at my model, because our present medical system does not have answers for these illnesses, and they are bankrupting the system. Dr. Horowitz: I wrote this book to empower patients with the information they will need to work with their health care providers. Many of these patients do not necessarily need a LLMD. They can work with a naturopathic doctor (ND), or someone who understands integrative medicine. Many ND's and alternative health care providers are not as expensive as many LLMD's, and many of them accept insurance, so I encourage these people to reach out to local integrative medicine doctors who can apply my 16 point MSIDS map. I believe ND's are a perfect place to start because they understand herbal protocols, diet and nutrition, and detox protocols. The American College for Advancement in Medicine (ACAM) is also a good place to look for integrative physicians, as well as groups like the Institute for Functional Medicine (IFM) and American Academy of Environmental Medicine (AAEM). Once you read the book and understand how the protocols work, you can work with a local health care provider to guide you in using supplements like glutathione, N-acetyl cysteine (NAC), alpha lipoic acid, NT factor energy (Researched Nutritionals) and certain herbal protocols, which can all help you to feel better. There are other ways the MSIDS model can be used to help improve health, especially regarding improving nutrition and helping make changes in the diet, as well as providing natural means to get patients to sleep. Your mind and your body work as one. They are not separate. We live in a very stressful world, and some form of stress reduction is important in most people's lives to help get the body and mind back in balance. I also feel that a spiritual path for people is very important because this is a difficult illness, and having that inner strength to fight, and to say to yourself "I am going to get better and then do my best to help others get well" with the help of a higher power, can be extremely powerful in supporting the healing process. To find a cure, I think the answers will not be found in the classical therapies we are using right now. I think what going to be required are novel antibiotic therapies to kill these intracellular infections. I also think we should look at oxidative therapies as an approach to decrease the infectious load, as well as doing studies on hyperthermia. We know that spirochetes don't survive in the body beyond 104 degrees Fahrenheit for more than 2 hours. If antibiotics and herbs are not penetrating into areas of the body because the bacteria are deep in the tissues and in biofilms, getting your body temperature up with the right antibiotic protocol on board might be an answer, with oxidative therapies. So I think a cure will be possible at some time in the future, but we have to find better drugs to treat persistent intracellular infections that are driving ongoing Herxheimer reactions and inflammation. We certainly need better biofilm protocols and efficient methods of detoxification to get these multiple toxins out of our body. It is also possible that in the future I will end up adding a 17th and 18th point to my MSIDS model. As time goes on and interested integrative medicine practitioners and researchers read my book, having had a chance to review and apply my model to their sick patients, they may find other diagnostic and treatment tools that improve the efficacy of the model. The MSIDS model is a work in progress, and hopefully will be expanded as time goes on. Dr. Horowitz: The best thing that everyone in the Lyme community can do to help this new paradigm move forward is to educate, educate, educate. We have to move this information out and correct all the misinformation circulating out there on Lyme and tick borne diseases. There are four groups of people that need this book. 1) Lyme disease patients that have not gotten better. 2) Patients with diseases where Lyme-MSIDS may be playing a role in the underlying disease process, but has not been adequately recognized, such as some patients with Chronic Fatigue Syndrome (CFS/CFIDS, ME), Fibromyalgia (FM), early Alzheimer's, and auto-immune diseases, including certain cases of lupus, rheumatoid arthritis (RA), and Multiple Sclerosis (MS). 3) All the different medical sub- specialists, including OB/GYN, rheumatologists, podiatrists, allergists, infectious disease specialists, neurologists, internal medicine practitioners, psychiatrists, family doctors, pediatricians… Everyone in the medical sub specialties needs to read this book, because Lyme-MSIDS mimics common illnesses and affects patients seen in these doctors' medical offices every day. If each of the sub specialists were to read this book, and understand how Lyme-MSIDS affects the patients coming to see them, we could potentially have earlier diagnosis and treatment, preventing major illness. 4) We also need to have politicians at the local, state, and federal level read this book, because they must work on behalf of their constituents to find solutions. Lyme is the number one worldwide vector borne spreading epidemic, so if we educate these four groups, and implement broader use of the multi-systemic screening questionnaire, then the odds are that we will be diagnosing and treating people a lot earlier, helping to prevent the chronic manifestations of this illness that I see every day in my office. Once this happens, and we realize how many people have really been affected, there will be a tipping point where we can't ignore the consequences of this global epidemic. My message to the Lyme community is therefore this: "I have empowered YOU with this information; this has to be a grassroots movement like it was with AIDS. We need a general in every state, starting with you, who is going to rally the troops and educate your friends, family, doctors and health care providers and politicians. You have to tell them about your suffering, and how you have gone to 10-20 doctors without finding relief, where one of the best health care systems in the world has not provided you with effective answers. My book is based on my clinical experience of seeing 12,000 chronically ill people over the past 26 years, and the MSIDS model has been effective in the vast majority of patients who have come to me. I am now sharing this information with everyone. We need to study this model and apply it to many of the chronic diseases affecting us in the 21st century that are causing people to unnecessarily suffer, while bankrupting the health care system. Let's turn a problem into a solution for everyone! "